I was sweaty and yucky from cycling, but as I flew around the corner and entered my street for the bike leg ‘home stretch’ I knew I would just have time to fit in a walk before work if I was quick. So my transition had to be super-fast, just like in a race. And I was sweaty and tired, just like in a race. Perfect, I thought. I jumped quite gracefully off the bike, awkwardly unlatched the gate and ran (hobbled?) my bike around the back, un-clipping my helmet as I did so. I can run with my bike one-handed if I am going in a straight line. With my helmet off and hooked over the handles, I navigated quickly around the obstacles that I pretended were other competitors’ bikes. Matilda instinctively realised what was going on and started leaping up at me, which added to the challenge. I imagined I was being mobbed by my triathlon supporters but I kind of hope that part doesn’t eventuate on race day. Take note please, mum. I stashed my bike, ran to the back door and rushed inside to quickly snap out of my shoes. Dodging Matilda’s tongue, my next task was to jam my feet into my runners as quickly as possible and tie the laces. Sidenote: I did try some elastic laces a couple of weeks ago but I hated them, so I have gone back to the slightly slower but more comfortable proper ties. I poured water down my throat as I ran to the hallway to grab my hat and dog poop bags (in my imagination, my hat and race number belt) and made it out of the door with a speed that impressed the dog immensely. She’d like for me to always hurry like that when we’re about to go for a walk. To really give the mash-up a good test, we also ran the first 20 metres out of the gate. It’s impossible to know for sure, but I felt a lot less wobbly than I had been expecting and if I hadn’t been worried about my stupid tendons I reckon I could have run on quite easily. Maybe my Bribie transition wont be the complete flop that I have been envisaging. Unfortunately, in my excitement at adding this extra bit of training into my morning session, I had completely forgotten that I would then have to walk the dog in my padded cycling shorts. If you haven’t seen the pictures, go here and laugh heartily. By the time I realised my predicament, I was half way down the road and even if I’d turned back to the house, all of my running/walking shorts were nestled safely in my drawer, inside the bedroom where my partner Shane was still fast asleep. I walked on, acutely aware that I looked as though I was wearing a nappy in my shorts. For 6km, as a myriad of locals drove through the streets of my suburb on their way to work, I shuffled alongside my dog bearing my shiny black sausage-legs (in unflattering shorts complete with built-in maxi pad) to all the world. Once again, although I felt sure I would die of the embarrassment, I didn’t. I’m starting to suspect that maybe Embarrassment is not the deadly disease I always thought it was. I wont be hurrying out for a walk in the shorts again, but it could have been worse. Matilda certainly didn’t seem to notice. So, back to the shopping. 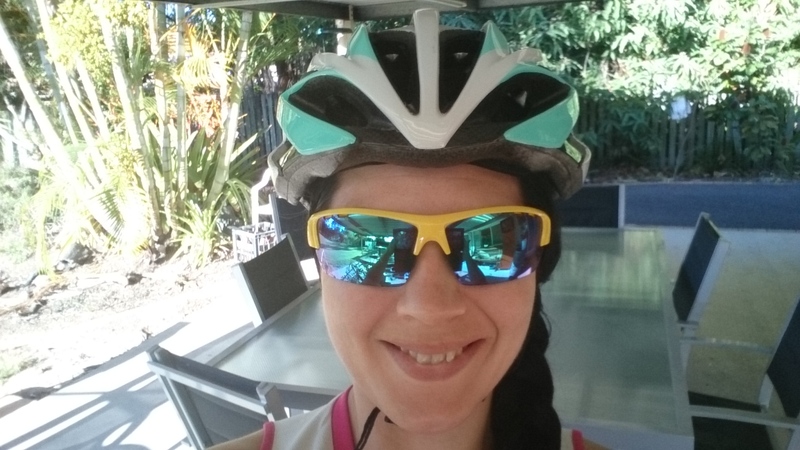 This morning’s ride and walk was the first public outing for my new sport sunnies: a pair of Ryder brand glasses that I bought on the weekend. They retail at around half the price of Oakley sunglasses and as I’m likely to either lose or break every pair of sunglasses I touch (it’s like magic) I decided they were a more realistic fit for my budget. Furthermore, this particular pair was marked down by 30% on sale. I think it’s because they’re yellow and green and no one else wanted to pretend they bike ride for Australia. But I do. So I snapped those babies up. They were very light to wear, in fact I hardly noticed I had them on and I was extra impressed that even at my sweatiest point, they didn’t start to slip down my nose. In fact, once I had put them on I didn’t have to touch the glasses again until I was completely finished and ready to get in the shower. I liked that I have a much better field of vision in sports sunnies, so that when I glance over my shoulder mid-ride to check what cars are coming, there is no frame in my way. And no matter how hard you shove them onto your face, your eyelashes don’t scrape over them and your cheeks don’t dislodge them from your nose if you smile or grimace. I award my Ryder glasses 10 out of 10. 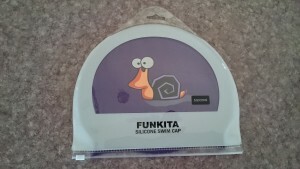 My new Funkita swimming cap finally arrived in the post. You may recall that I put my fingernail through my old cap, which didn’t matter too much to begin with but then I completely tore it apart on Friday. 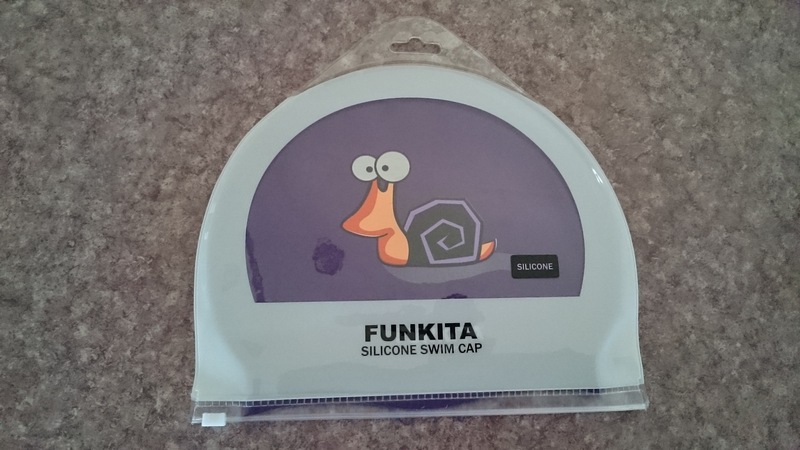 I couldn’t justify the cost of a Funkita cossie but the cap is a bit more affordable. I chose this one because it has a snail on it and I am actually slower than a snail when I am swimming, so it seemed appropriate. The bewildered look on the snail’s face is very relatable too. 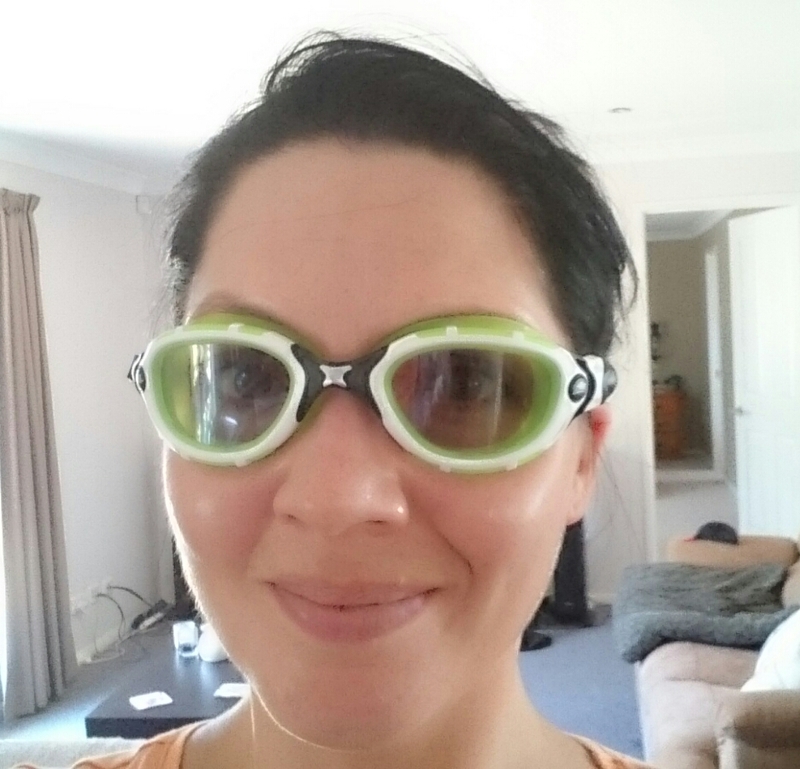 I also treated myself to new goggles, because my trusty K-Mart bargain goggles were just hurting my eyes too much. By the end of a ‘long’ swim (long for me, anyway) it was starting to feel like they were actually slicing my eyeballs out of the socket. And I noticed I had blood under my left eye after my last swim. 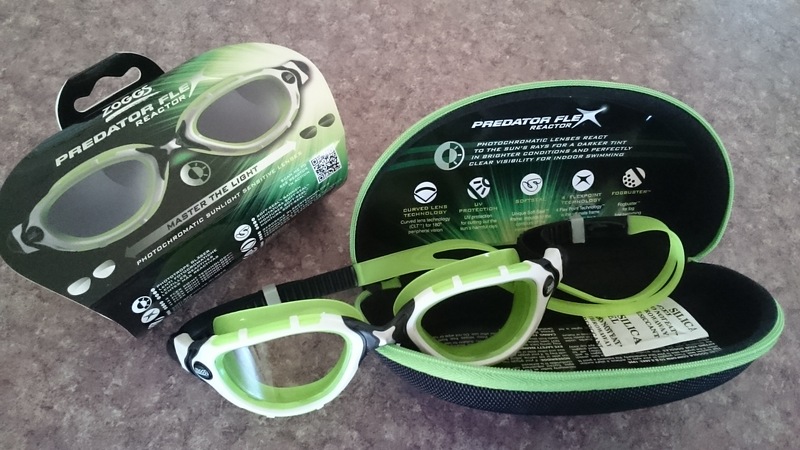 So I spent a stupid number of dollars on new Zoggs Predator Flex Reactors. Yes, that is what they are called. Not just ‘goggles’. They were featured in my Triathlon Magazine so you know they’re going to be good. 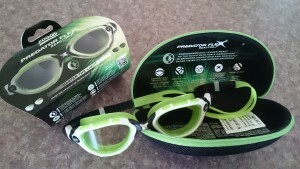 These Zoggs Predator Flex Reactors actually react to sunlight, and the lenses darken up like sunglasses. So they will be great for ocean swimming. Unfortunately I do look like a super-villain I have named FROGWOMAN when I wear them. If I ever become a comic book writer I will base my stories on the adventures of FROGWOMAN. And last but not least, I bought a book. Because it has been frustrating and disappointing to find myself banned from running and unable to practice proper mash-ups. 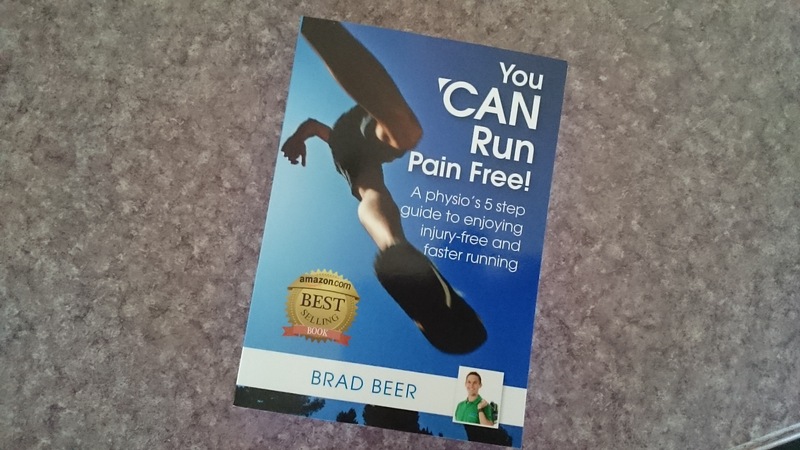 So I need to understand how to prevent injuries in the future so that I can keep running. 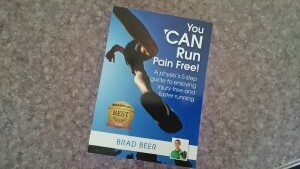 I found this book (You CAN run pain free!) to be highly recommended online, but I haven’t read a single page yet so I will let you know what I think of it in a future post. So, I made a small dent in the shopping list and I still have time to purchase some emergency pieces before the Bribie Triathlon as needed. And believe me, things are needed. We are in emergency zone 3 – buy all the sh*t. Drastic times call for drastic measures. I’m doing a bloody triathlon, don’t you know. This entry was posted in Show Me Shopping and tagged bike, bribie, bricks, cycling, dog, dying, ego, newbie, Shane, training, triathlon. Bookmark the permalink. ← Oh. My. Triathlon God. HA HA well actually that sounds like fun! We might need to practice it though. I was more concerned about the pawing and licking that Matilda was inflicting upon me. No licking between the bike and run, please. Don’t worry darling, Grandpa will be there with his roller walker and you can hop on that,while Mum pushes your bike. I might borrow your disabled sticker from the car and stick it on my bike!